So many modern boats seem to sit on the water rather than in the water, which makes them look a bit unstable, perhaps even unseaworthy. I think the problem comes from designers trying to fit the maximum amount of accommodation into a compact hull so the only way to get more space is to go up. 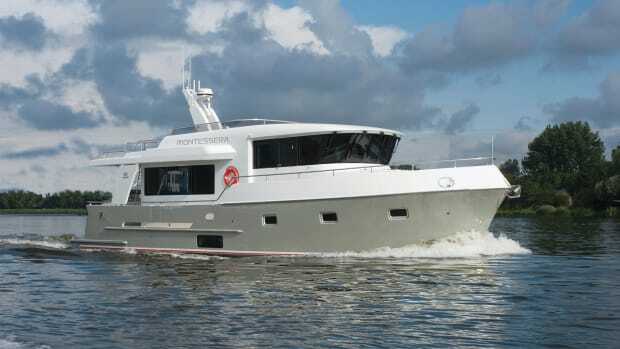 There are no such problems with this new yacht from Linssen. The boat not only sits comfortably in the water, but its low profile seems to enhance its sound, seaworthy look. Yet when you go on board there is no feeling of sparse economy in the interior space, and as with all Linssens, it has a desirable seaworthy design. As the biggest builder of steel yachts in the Netherlands, and perhaps in the world, Linssen has a strong incentive to get things right. Their yachts are built on a production line, so it is important for them to do things the right way from the beginning. Significant time is spent developing and refining a new design before it goes into production. You can see this attention to detail in so many aspects of the new 40-foot Grand Sturdy. 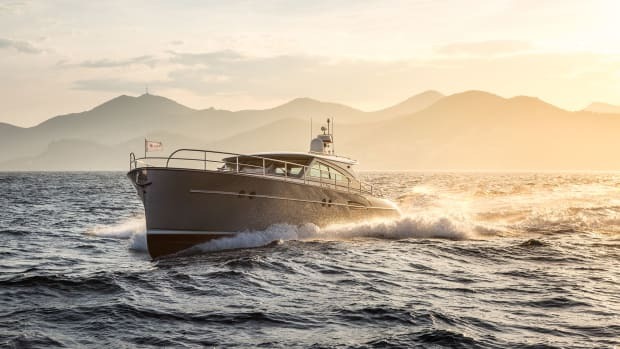 While Linssen seems to work on the philosophy of keeping things simple, they also make sure that all the bases have been covered in terms of comfort, seaworthiness, safety, and practicality. The cockpit features plenty of built-in seating & an overhead cover to protect from rain or sun. I am not getting any younger and so moving about on a yacht can sometimes be a challenge. 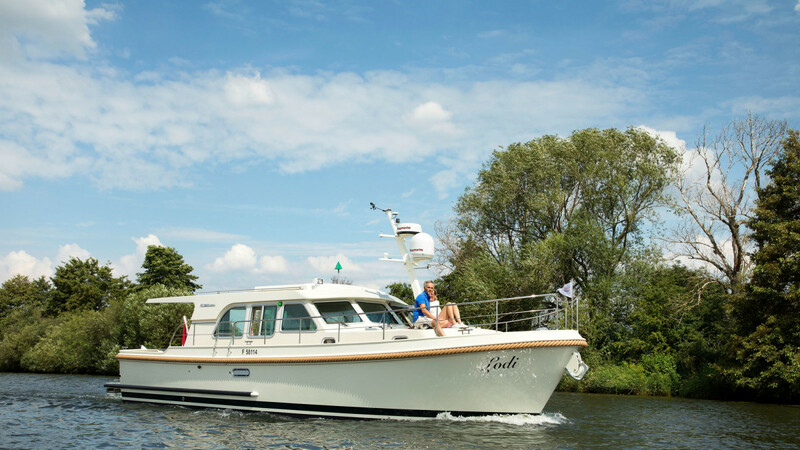 But I don’t think that I have found a yacht that is quite so easy and comfortable as this Linssen. This is partly due to having the saloon and cockpit decks on the same level, and there are only a few steps down to the forward accommodations. 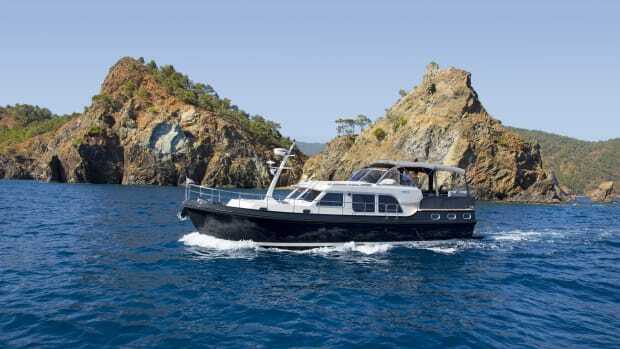 The low profile helps, of course, because there are no ladders or steps to climb up onto the flybridge, but you can still get your share of fresh air with the large opening sunroof over the helm and saloon. 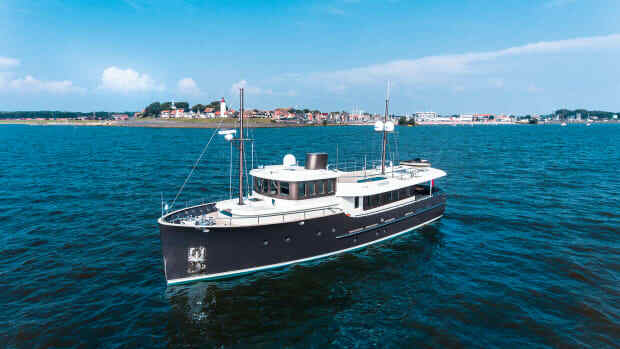 One thing I like about most Dutch yachts is that they are easy to get on and off as well. There is no need for balancing on a shaky passerelle or jumping down onto a swim platform. 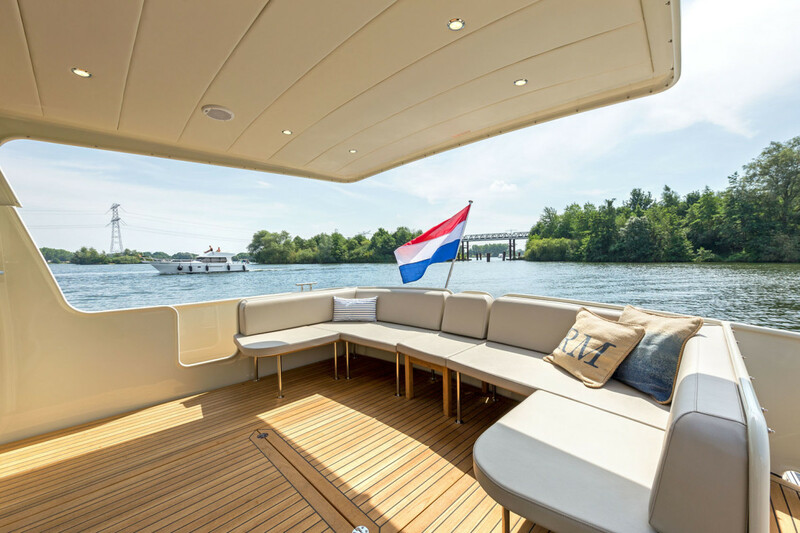 The designers take into account that yacht owners and their guests are not always as athletic as some youngsters, and on this Linssen it is an easy step up from a dock onto the side deck through a gap in the bulwarks at the cockpit. At the stern, the center section of the transom settee can lift up to reveal a transom door. This allows single-step access to the narrow swim platform you can use to step ashore if you are in a stern-to mooring. All of these detail come in a very practical and stylish package. 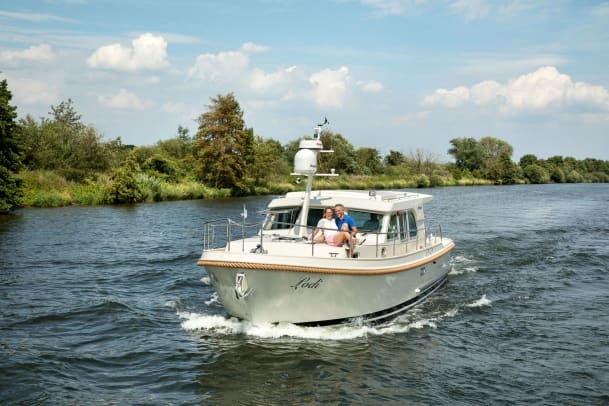 With every Linssen, the focus of the style is on the thick, traditional rope fender that runs around the hull just below deck level. This gives the yachts the traditional look that marries well with modern lines, and it also serves the practical purpose of a rub rail. There is a second rub rail aft along the hull near the waterline, which is useful when you are coming alongside a low dock. Below the deck line the hull has a slight flare in the bow sections, which can be quite rare these days as designers often want to squeeze in as much internal space as possible. This flare keeps the spray under control, and combined with a fine entry at the waterline, it shows that Linssen has not succumbed to the current trend of a vertical stem, so the lines of the 40 are going to please the more traditional owner. Linssen’s trademark low air draft makes it a great option for canal trips, Great Loop passages, or anywhere bridge clearances can put a crimp on cruising schedules. 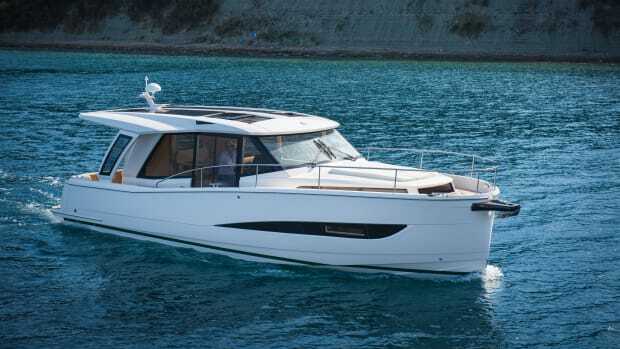 Linssen made no attempt to utilize the space above the saloon as a flybridge, so the 40 has a pleasingly low profile. 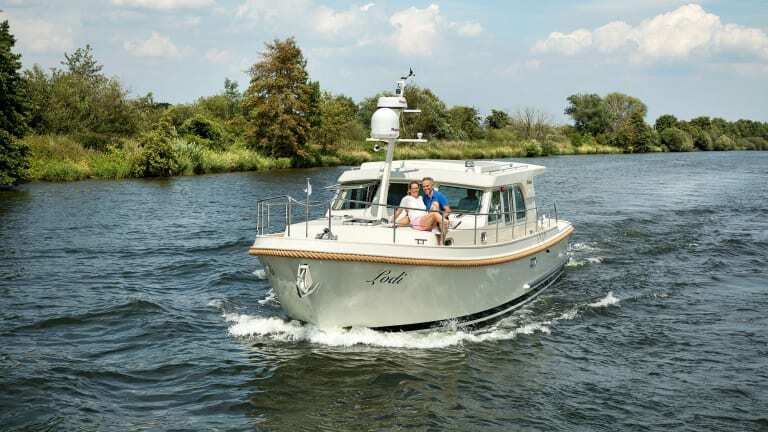 The builder does offer an alternative version of the 40 with a raised open helm and a cabin aft, but the sedan version that was tested looks much better balanced. The after end of the superstructure extends to the transom as a fixed shelter, what Linssen calls their “longtop” style, and the cockpit can be enclosed by screens to make it useable in colder or inclement weather. The mast is located forward of the superstructure, and in true Dutch style it can be lowered for passage under low clearances. The spacious cockpit is great for sitting out on balmy evenings with generous seating provided by the U-shape transom settee. Double doors give direct access to the saloon where warm cherry paneling prevails. Though I did find the hanging curtains around the saloon a bit of an irritation, particularly those around the windshield where they detract from the view ahead, I guess they are part of the balance of using a boat in harbor and at sea. The windshield window on the starboard side above the galley can be opened for ventilation, and sturdy wipers keep the other forward windows clear. The saloon sets up nicely for a couple, with a fold-up table for two and a large L-settee. 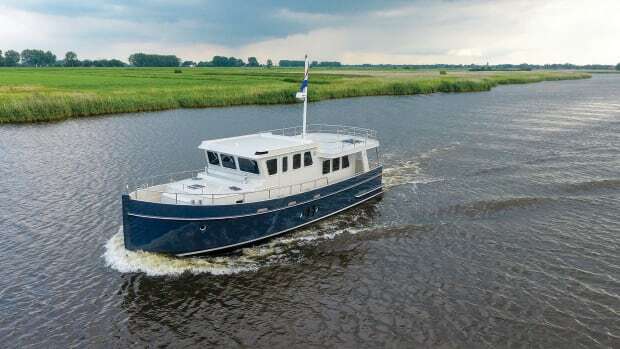 The focus of the saloon is on the helm station on the port side and, in keeping with the Linssen philosophy, this has been kept simple but includes all the basic requirements. 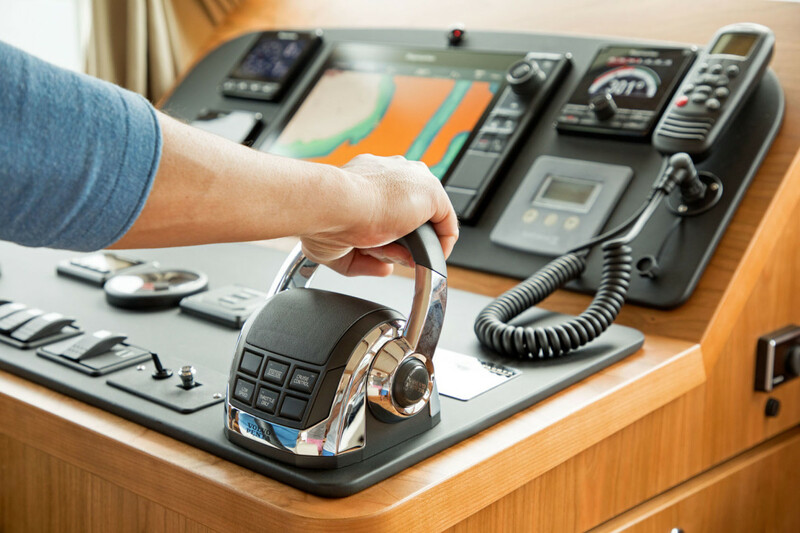 A large Raymarine MFD holds centerstage combined with an autopilot and echosounder, and in standard form, the dash is wired for additional instrumentation. 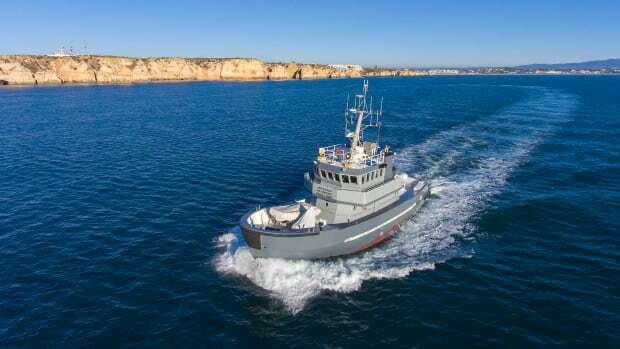 Just a Side-Power bow thruster is fitted as standard, but the test boat also had a stern thruster—a worthwhile option with just a single main engine installed. There is the option of a twin-engine installation, and the engine control on the dash looks like a two-lever unit until you notice that the two levers are joined at the top. Apart from the obscuring curtains there is a clear all-around view from the helm. 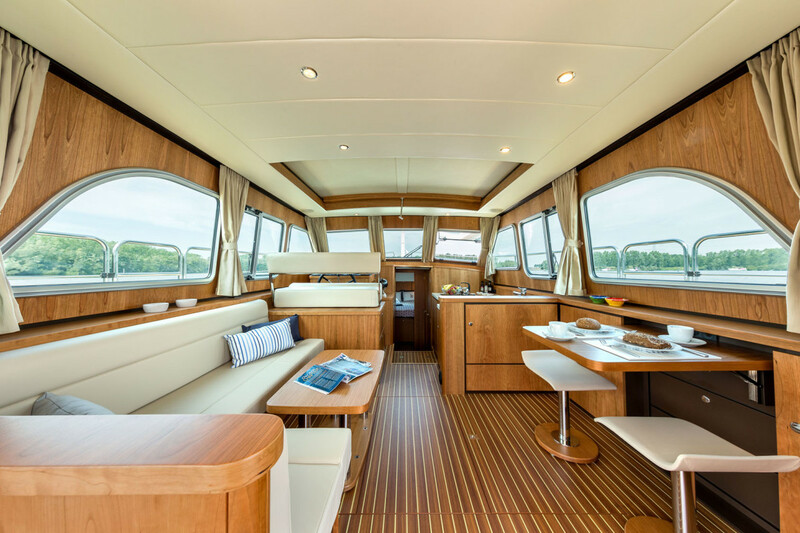 Alongside the helm on the starboard side is the compact galley, which is also fitted out with all the basic necessities. The standard cooktop is a three-burner gas unit, but you can specify electric. You’ll also need to specify the generator from the options list. There is a fridge/freezer and a stainless steel sink but no oven, and the space for food preparation is limited but adequate for a couple. Behind the galley there is a small fold-out table with stools that serve as a breakfast dinette (or an office desk if you have to work on board). The main seating is opposite this setup with a low table surrounded by a settee that could also serve as a dining area if there were more than two on board. A TV is hidden away in the locker fitted into the galley plinth, and this, combined with a mast antenna, comes as standard. The master stateroom is light and bright, with ample headroom for tall owners and guests. The options list is extensive and designed to allow you to tailor this yacht to your personal requirements and cruising area. For wine buffs there is a cellar that can be fitted under the shallow stairs that lead to the cabins, and this can be fitted out for a variety of stowages. Lots of alternative colors and fabrics as well as woods let buyers personalize the yacht to their style. 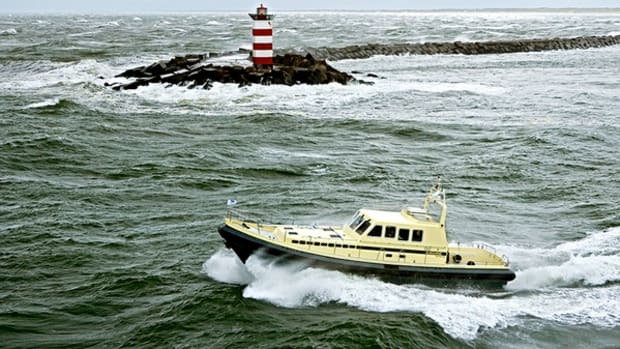 There is even a variety of tender stowage options, as well as navigation packages, which can include radar. Magnus rotary stabilizers are another option, as is air conditioning, but both of these need a generator to be installed. For those planning to use the yacht for long-distance cruising, Linssen offers a washer/dryer unit as well. 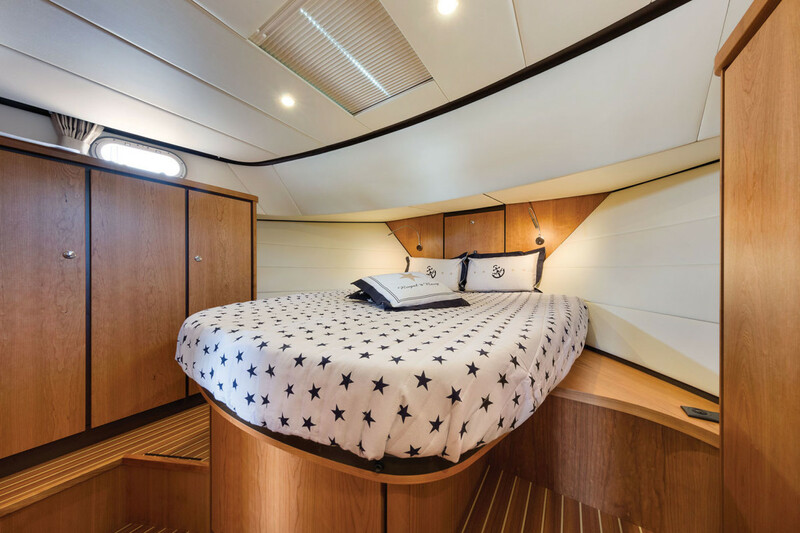 The master cabin in the bow has a very comfortable-looking double bed, and a twin-berth cabin is on the port side. These cabins share a toilet and washbasin that is also directly accessible from the master, whereas the shower room is in a separate compartment. There is adequate stowage for personal belongings, but some of the hanging closets are rather shallow. 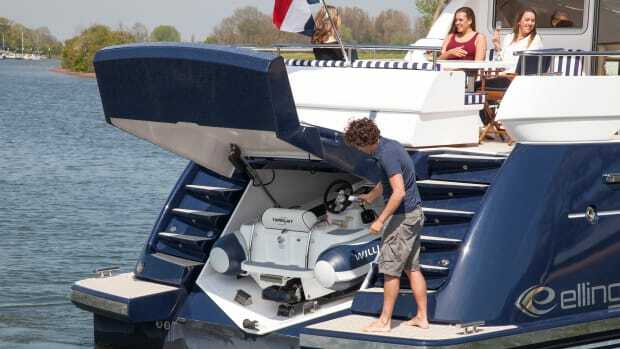 For a single-engine installation, the standard unit is a 110-horsepower Volvo Penta diesel, and this drives through a conventional shaft-and-propeller system. The propeller is partially protected by a skeg that runs under it, which also provides lower support for the large spade rudder. The rudder gives exceptional steering control even at low speeds, and combined with the thrusters it enables precise control in tight spots. 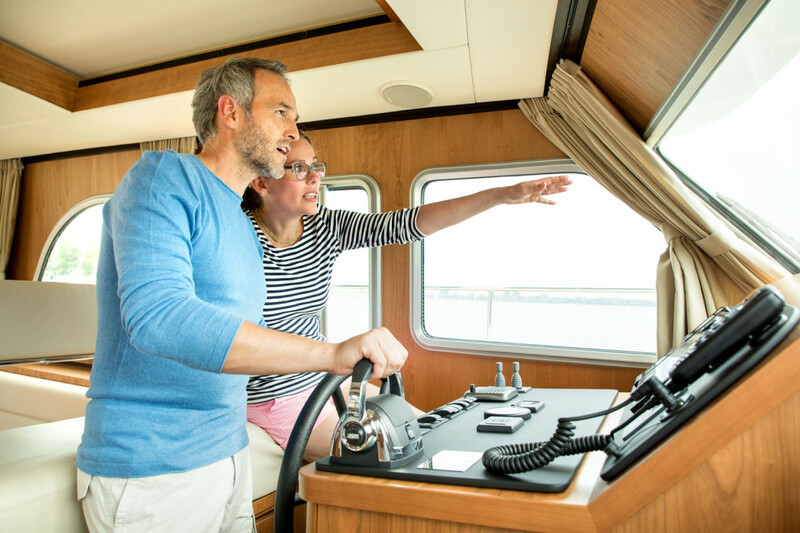 You can specify a remote control that allows you to control the engine(s), steering, and thrusters from anywhere in the boat, a great boon for those traveling single-handed. When twin engines are selected, they have the same simple transmission, but each of these Volvo Pentas have 75 horsepower. Out on the water this yacht handles difficult crossing waves from the wash of passing barges very well, and it should prove to be a comfortable boat at sea. You will not break any speed records with a single engine topping out at 8 knots, and comfortable cruising speeds fall somewhere between 6 and 7 knots. This is a yacht for those wanting a quiet, comfortable way of life on the water. The engine is well insulated and all you hear is a low rumble with noise levels around 70 dB when underway. Simple, straight-forward dash is user-friendly. I have been around the Linssen production facility in southern Holland where everything is carefully planned to ensure high-quality assembly of their yachts. Everything is done in house, and extreme care is taken with the preparation and painting of the steel hulls to ensure a long and corrosion-free life. I fell in love with this 40-footer. Her easy approach to boating took me back in time. But this classic simplicity is combined with a carefully developed design standard that should withstand the test of time. The extensive list of options does allow you to make the systems more complex, but at least you have the option to choose the level of technology that suits your lifestyle.